When Supernatural gets it right, the show gets it really right. And with a return to the arc, I get an episode that hits all the right notes and leaves me waiting for the outcome of all these interesting story threads. This is going to be an explosive season finale, I can feel it coming. This latest episode was almost a who’s who of characters, but with the overload of guest stars it still didn’t feel excessive. Each story got the right amount of screen time, and it all worked together to bring us closer to an intertwined plot. For most of the time, Sam and Cas were paired up. 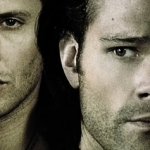 Their mission was to find a way to get to Metatron and find out what he knows about the Mark of Cain. Only problem is that Hannah and the rest of Heaven’s guard aren’t going to just hand him over. And despite Cas, with his hurt feelings and anger boiling, there is another way in. 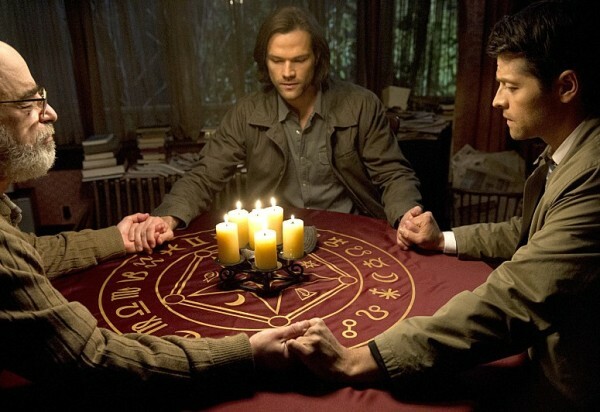 If they can’t get Metatron willingly, then they’ll just have to bust him out. Cue a visit to the other side and an ally that they have there. It was fantastic to see Bobby again! Wonderful that he was living in his own personal paradise with plenty of Tori Spelling books to keep him occupied. But when his boys need him, he’s going to be right back into the fray. Even from the other side, he’s looking out for Dean and Sam. [And of course the door between the two realms was going to be number 42.] For his involvement, he may see some serious repercussions from Heaven’s guard, but I have hope he makes it through and isn’t tortured for all eternity. And I do echo his last warning to Sam. 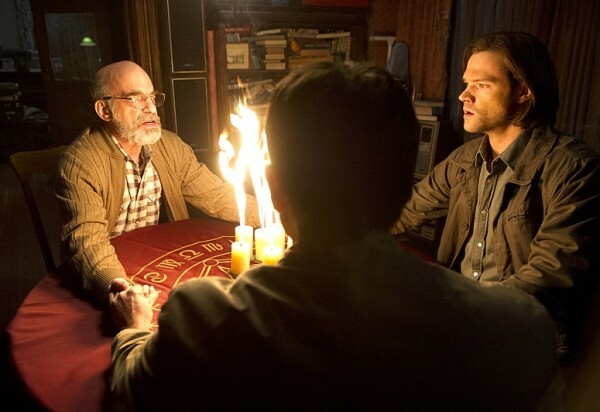 Going behind Dean’s back on this might backfire, but Sam has to do what’s right. Bobby believes in him, and I do as well. I just hope the two of them make it out alive. I do understand why Sam’s doing all he can to save Dean. His older brother is being mentally tortured, as evidenced by his very loud nightmares, but Dean will continue to push it down until he can’t do it anymore. 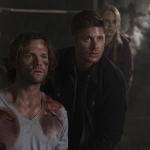 It’s up to Sam to help save Dean, and he willingly does it each and every time. They both do. The Winchesters know sacrifices well — though, they both know brotherly banter well, too. The light exchange between Sam and Dean at the beginning, when Sam is trying to ditch his brother in order to sneak off and join Cas, was funny. As was Dean’s pranking of Sam’s room in his absence. 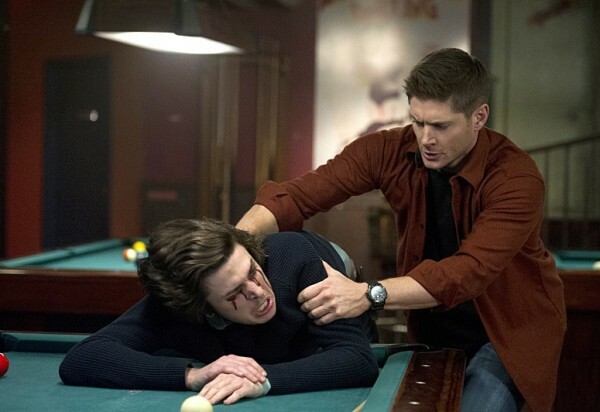 Plus, we got to see Dean hustling pool! It’s been so long since we’ve witnessed that, but he hasn’t lost his skill. Too bad Rowena had to destroy his day out at the bar. She is a manipulative witch, and now she’s not only lording her powers over Crowley, but Dean as well. It was nice, though, to see her fail at both this episode. For too long she’s been trying to get into Crowley’s psyche and make him do her bidding, and for too long he’s been dragged along in the name of family. But instead of taking Rowena’s word for it that Dean beat her up, he instead went to Dean himself and they had a real heart-to-heart. Their relationship is so odd, but so fascinating to watch. And Dean knocked some sense into his head. Family is not about manipulation, but about having their backs. I’m glad that Crowley recognizes that Rowena being family doesn’t mean he has to bend to her will. And now that he’s kicked her out for good, and got his mojo back a bit, there’s no telling what he can do. And there’s no telling what Rowena will do either. Just because he kicked Mom to the curb doesn’t mean we’ve seen the last of her. Now the question remains, how is this all going to come together? I’m sure it’ll be bloody, and I’m sure there will be some deaths, but as much as I fear it, I’m also excited for it. It wouldn’t be Supernatural if I didn’t get my heart beaten and bruised a couple of times.